Welcome to the BOOST! Company website!!! From this site you will be introduced to BOOST! and learn the history of this great company. And read about the company's new fruit flavor concentrates. You will be able to order BOOST! and have it delivered right to your home. We had a great 100th year celebrating Ben's drink. Now we are on our 105th year producing South Jersey's original drink. 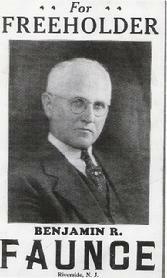 ON APRIL 20, 1905 BENJAMIN RICE FAUNCE WAS ISSUED A PHARMACY LICENSE BY THE NEW JERSEY BOARD OF PHARMACY. BEN OPENS HIS FIRST PHARMACY ON SCOTT STREET IN RIVERSIDE NEW JERSEY. NEEDING MORE SPACE HE MOVES TO 217 BRIDGEBORO STREET. HE SELLS HIS OWN BRAND OF COUGH SYRUP, HEADACHE CAPSULES, TOOTHPASTE, MEDICATED LOTION, BILE OINTMENT, WELLNESS TONIC AND ­RECREATIONAL DRINK (TAK-ABOOST). TAK-ABOOST IN A CONCENTRATED FORM IS DISPENSED AT THE SODA FOUNTAIN IN THE PHARMACY. PER CUSTOMER REQUEST IT IS MIXED WITH WATER, SELTZER WATER, MILK, IN MILKSHAKES AND AS A TOPPING ON ICE CREAM. THE TAK-ABOOST TRADEMARK IS REGISTERED WITH THE UNITED STATES TRADEMARK OFFICE IN 1913. "BOOST" SHOPS START OPENING IN NEIGHBORING TOWNS SUCH AS PALMYRA AND BURLINGTON IN NEW JERSEY. OVER THE YEARS THE PRODUCT HAD THE NAME MODIFIED. FROM TAK­ABOOST TO DRINK ATOAST TO TAK-A-BOOST BUT SETTLED ON "BOOST!" IN 1997. BOOST! IS AVAILABLE IN ORIGINAL (SUGAR AND CAFFEINE), CAFFEINE FREE, SUGAR FREE WITH CAFFEINE AND SUGAR FREE WITHOUT CAFFEINE. THE COMPANY SHIPS BOOST! WORLDWIDE. WE HAVE BEEN SHIPPING SINCE THE VIETNAM WAR.. .AS FAR AS ITALY AND NOW TO THE SOLDIERS IN IRAQ. RECENTLY A CUSTOMER HAD BOOST! SHIPPED TO KOREA FOR A BIRTHDAY PRESENT. BOOST! HAS BEEN QUENCHING PEOPLE'S THIRST FOR OVER 100 YEARS. BOOST! available in stores in 1/2 gallon glass jugs only. Look for this sign in Deli and convenience store windows! Hunters Farm Market is selling 1/2 gallons of BOOST! Products. For Leasing Slushie Machines, click on "Slushies & Jet Sprays" page. BOOST! Slushies are good year 'round. Remember BOOST! is economical. 1/2 Gallon of BOOST! concentrate makes 40 8 ounce drinks.They are easy to handle too. 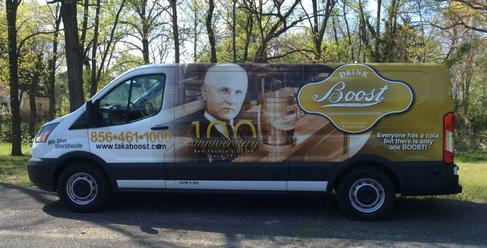 SEE PRODUCT INFORMATION TAB FOR DELIVERY OF ALL BOOST! PRODUCTS TO YOUR BUSINESS. Website was last updated on 02/18/19. This site was created and being maintained by GB Website Design, LLC, please send your comments or changes to webmaster.